GLEAMviz.org – New GLEAMviz update: identifying disease carriers. 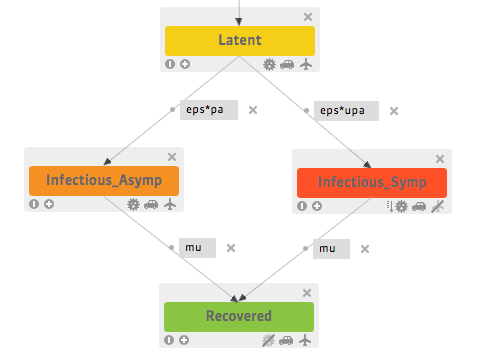 New GLEAMviz update: identifying disease carriers. Posted on August 5th, 2014 , under News. We have just released the v5.1 version of GLEAMviz. This release is the first after the major rewriting of the v5.0 and along with stability fixes it includes a few major improvements in the model specifications and the computational framework. The compartments used in the disease model can be marked as “carrier” as well as “clinical cases”. In particular the model builder requires marking all those compartments corresponding to individuals carrying the pathogenic agent (carriers). This includes also exposed individuals in the latent/incubation period. This feature let the computational platform to track potential carriers as well as symptomatic and clinical cases, making it possible to track more accurately the international spread of the disease. The corresponding change in the simulation engine is also required to allow forthcoming additional features such as the possibility of constructing infection trees and improving the performance of the computational platform. This revision includes also some bug fixes and usability improvements (handling of iconified windows, charts rescaling, etc. ).